Flowering vines add so much to a garden. They add height, act as filler plants, and most bloom for months. While it takes time for most perennial vines to become established and flower well, that's not a problem with annual vines. Many spring-planted annual vines will start flowering by mid-summer and continue right until frost. Despite their multiple advantages, many gardeners don't think to use these annual vines in their gardens. Even garden centers tend to downplay them because annual vines can become a tangled mess in the store. But these plants are incredibly easy to start from seed, indoors or out, and require little maintenance. For the price of a packet of seeds, you have vining flowers that can grow up structures and through other plants or cascade down from hanging baskets. Thunbergia alata is a charming, dainty, short annual vine that grows well in containers. The flowers are small (1 1/2 inches) and come in shades of white, yellow, and orange. Sporting dark centers, they can resemble the garden perennial black-eyed Susans in color scheme if not petal shape. You can often find black-eyed Susan vines sold in hanging baskets. You will get longer vines when you grow them in the ground, but you tend to get more flowers if they are grown in a container. Being pot-bound encourages them to bloom. The plants are easy to grow from seed. You can start the seed indoors or direct sow after danger of frost. Keep the soil moist, and you should see germination in one to two weeks. It can take a while for the vines to start flowering, anywhere from six to eight weeks, so starting the seeds indoors two to four weeks before your last frost date will speed things along. Start the plants in peat pots or paper pots so that you can transplant without disturbance. Choose a site with full sun to partial shade. Black-eyed Susan vines like soil rich in organic matter and regular water. Also, don't let your container dry out completely. You can expect the plant to grow 6 feet tall (or long, if trailing out of a hanging container) and to be covered with flowers. They will get even larger in the United States Department of Agriculture hardiness zones 9 to 12, where they are perennial. Canary creeper (Tropaeolum peregrinum)​ is a late-season bloomer, starting in July and going through October. It is in the nasturtium family, but there's not much of a resemblance. The 1-inch yellow flowers really do resemble feathery birds—hence the name. The foliage is also attractive, with deeply divided palm-shaped leaves. Canary creeper is a vigorous grower, but like its nasturtium cousins, it doesn't really grab hold of anything. It's more of a scrambler, and if you want it to grow up a trellis or other support, you will need to tie it in place. It does look good simply vining through other plants, though. The vines can easily reach 8 to 12 feet long. Although canary creeper is perennial in USDA hardiness zones 9 to 10, it is very often started from seed each year and grown as an annual. If you'd like to attract hummingbirds to your garden, planting a cardinal climber vine (Ipomoea sloteri) is a good start. The trumpet-shaped flowers are full of nectar and are a brilliant red, which hummingbirds like. Cardinal climber has feathery, light leaves that filter the view, allowing you to look through the vine but also providing some privacy. The plants flower heavily, but they can also self-sow aggressively. Only Arizona has banned their sale as an invasive. Usually, the volunteer plants can be easily weeded out, and many gardeners enjoy their free-growing nature. The plants do not like being moved, so direct sowing in the garden is your best option. The hard seeds will germinate better if scarified (nicked or rubbed with sandpaper) beforehand. But the plants are not particular about soil—give them regular water and they should take care of themselves. The vines can reach lengths of 6 to 12 feet. Because they tend to twist and twine, it's hard to know exactly how long they are. Note: The seeds are poisonous if ingested. Climbing snapdragon ​(Asarina)is a deceptively fragile-looking vine, but in fact, it is quite tenacious. The common name is a bit of a misnomer because this is not a snapdragon variety, and the trumpet-shaped flowers are not reminiscent of its namesake's flowers. Asarina is a free-flowering twiner that looks lovely in containers and spilling over walls. The vines will twine around strings and trellises and can be cut back if flowering drops off. Climbing snapdragon can even be grown as a houseplant if you have enough sunlight coming in. There are many named hybrids of Asarina, although seeds can be hard to find. The flowers come in red, pink, lavender, and blue with speckled white chins. Climbing snapdragon is perennial in USDA hardiness zones 9 and above, but it is fast growing and quick to flower when used as an annual. Vines will climb about 6 to 8 feet and bloom all summer. The sweet-smelling flowers of this plant are indeed shaped like a cup and saucer. The actual flowers of the plant are the internal "cup," which is usually lavender or white. They are surrounded by a saucer, or collar, of a green calyx. The vines gently attach themselves to supports with tendrils. Cup and saucer vines (Cobaea scandens) take a while to start blooming, so it helps to start the seeds indoors, six to eight weeks before your last frost date. The flat seeds germinate better when planted on their edges, which makes them less prone to rot. Cup and saucer vine s are not particular about the soil they grow in, but for the best blooms, plant them in full sun. The vines can grow very long, more than 20 feet in ideal conditions. But don't be tempted to put them outdoors too early. They are sensitive to cold temperatures. Although often grown as an annual, the vines are perennial in USDA hardiness zones 9 to 11. An old favorite, morning glory is one of the easiest flowering vines to grow. In fact, it can be a little too eager, self-sowing with abandon. Even so, gardeners who love this vine are willing to weed out the extras, and they do make for a fast-growing screen. Morning glories (Ipomoea tricolor) are vigorous vines that don't require much care, and they come in a variety of colors. 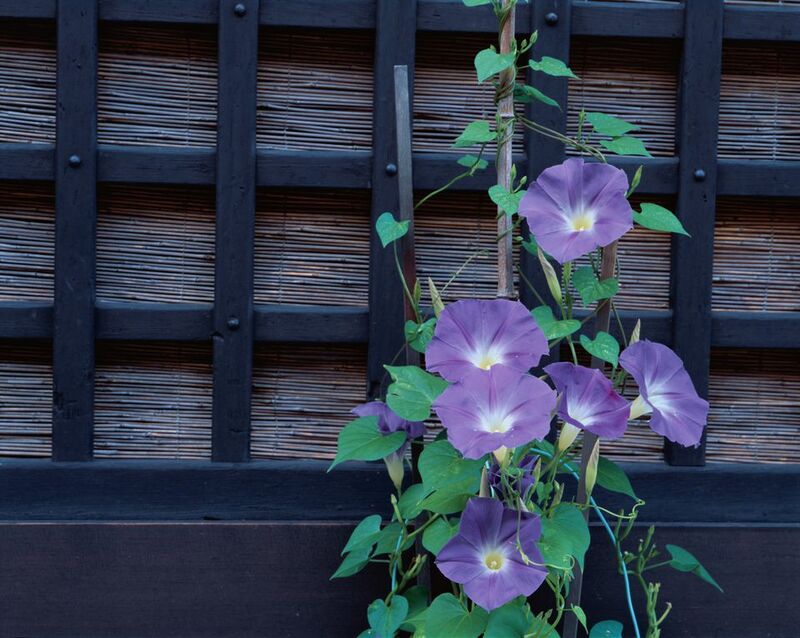 This plant is called morning glory for a reason: The flowers will close in the afternoon heat. Some people also refer to the plant as "back-to-school" vine, because it sometimes waits until the end of summer to start flowering. Morning glory is a true annual plant and does not perennialize, except via self-seeding. They do best when direct-sown in the garden, anytime after the danger of frost is past. The seeds germinate better if scarified. These are tightly vining plants that can grow 15 feet or more. Ornamental gourds aren't grown for their flowers but for the large, attractive seed pods—the gourds. There's a wide variety of gourds that grow easily and quickly in just a few months. Many people let the vines sprawl on the ground, like squash, but if you are growing them for decoration, gourds remain cleaner and less pest-prone if you give them a structure to grow on. A pergola or arbor looks especially interesting with the vines growing across it and the gourds dangling above your head. Many gourds are easy to dry and can be used as decorations or crafts, such as gourd birdhouses. Grow gourds as you would any other member of the squash family. They need full sun and soil with plenty of organic matter worked in. Unfortunately, they are also subject to all the same pests and ailments as squash, from squash beetles to groundhogs to powdery mildew. But they are prolific vines, and the colorful harvest at the end of the season makes a little pampering well worth it. Everything about this vine is riotous. The heart-shaped leaves have purple veining on the undersides. The stems have a deep-purple cast. The profuse blooms are a rich lavender, and the glossy pods are an almost day-glow purple. At one time, purple hyacinth bean (Lablab purpureus) was an important foraged food source, but now it is mostly grown as an ornamental. The vines grow quickly and start flowering early. Flowering tapers off as the pods begin to form, but the plants remain attractive and continue spiraling upward. Purple hyacinth bean is best grown by direct-sowing in the garden. As with so many flowering vines, the seeds are tough and germinate better if scarified first. Flowering generally starts in midsummer and continues through fall. When there are a lot of seed pods forming, the flowering will diminish, though this is not a drawback because the pods are just as attractive as the flowers, if not more so. The vines usually reach a height of 6 to 15 feet. This plant can be perennial in USDA hardiness zones 10 and above, where they may develop woody stems. Note: The pods are edible but are toxic if not cooked. Runner beans, like hyacinth beans, are generally grown for their ornamental flowers. However, scarlet runner beans (Phaseolus coccineus) make a nice edible bean when harvested young. Because the flowers are so lovely (and there are so many of them), you can understand why it has gained a reputation as a flowering vine. "Painted Lady" is a soft-red-and-white flower, and the vines can tolerate heat better than most runner beans. "Moonlight" is a pure white flower that produces one of the better-tasting, stringless runner bean pods. The plants are perennial in hot climates and may even survive a mild winter in cooler zones. They require the same care as pole green beans and can produce pods just as heavily. Other than regular water, they shouldn't need much care. A layer of mulch will keep the ground moist and cool for them, and a side dressing of compost in midsummer will give them an extra boost to get through the remainder of the season. Sweet peas (Lathyrus odoratus)​ look delicate, but this is a tough little vine that favors the cooler temperatures of spring and fall. The flowers are known for their heavy, sweet fragrance, but not all new cultivars are scented. Read the seed packet before buying. Sweet peas make wonderful cut flowers. The more you cut, the longer the plants will bloom. If you grow them in the vegetable garden with your pole beans, they add color and fragrance, and they also entice more bees and other pollinating insects to your veggie plants. Sweet peas can be direct sown about the same time as edible peas. They have a hard seed coating, and scarification will speed germination. If you want to get a head start, you can sow seed indoors, about four to six weeks before your last frost date and transplant outdoors after all danger of frost has passed. When the plants reach about 3 to 6 inches tall, pinch the seedlings to encourage strong side shoots. Don't be afraid to cut your sweet peas; the more you cut, they more buds they will set. Vines climb about 6 to 8 feet tall.